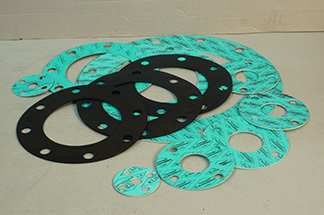 Non-Standard Custom Gaskets produced to specification as required. We fabricate a variety of custom gaskets in house as well as represent several manufacturers with whom we have decades long associations. By supplying our customers with an additional layer of service, we have won the loyalty of some of the San Francisco Bay Area's most respected and trusted contractors. Our willingness to maintain a local stock of the items they just might need sets us apart. Our dedication to our customers needs is foremost. In some cases, a drawing of the required part is not available. In many of these cases we are able to identify the material used and duplicate the item. If for some reason we cannot offer a solution, we'll gladly lead you in the right direction using our 40 years of experience. E-mail us with your request, or give Customer Service a call. We stock KLINGERITE® Style 4401 Green General Purpose Standard Full Face Flange Gaskets in sizes 1/2" through 24" in both 1/16" and 1/8" thckness. In addition, we stock both Cloth Inserted Rubber (CIR) and Neoprene Rubber Full Face gaskets in 1/8" thickness. 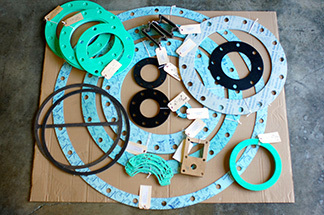 Generally, we can produce other standard pipe flange gaskets in the standard sizes shown here as well as Ring Type and Metric Size Flange Gaskets for will call or shipment the same day.